Dubliner Colm Healy has an interesting work history. He left the civil service in his early 20s, trained in IT and, in 1994, set up as an outsourced IT provider. In 1999, at 32, he sold that business and travelled the world working in IT, teaching English, and buying and selling properties. 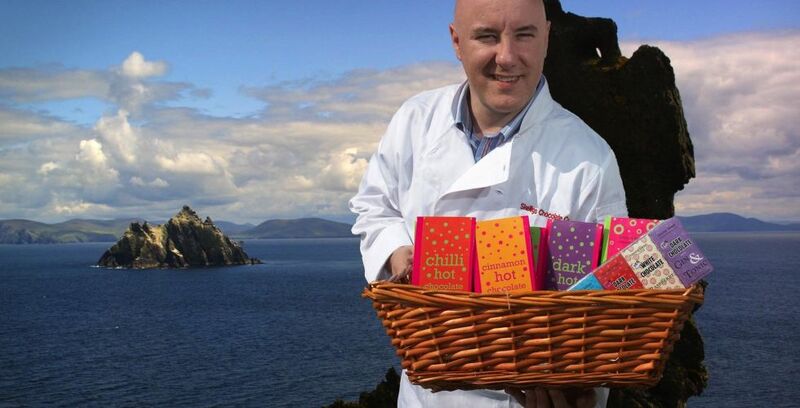 In 2004 he returned and bought Skelligs Chocolate, a small chocolate maker in Ballinskelligs, Co. Kerry. He grew the business and, by 2010 it employed 10 people. Then, disaster struck, when the factory was destroyed by fire. However, thanks to support from locals he rebuilt the factory to include a visitor centre and cafe, as well as a wholesale division. By 2015 it had a staff of 15 and more than 20,000 visitors a year. Come see the most westerly chocolate factory in Europe, situated on the Wild Atlantic Way overlooking Skellig Michael on the beautiful St Finian’s Bay, where you can see handmade chocolates produced in our workshop. To come back from a devastating fire in 2010, and bigger and better than before. I’m not a competitive person, except with myself, and I wasn’t going to be beaten by an external factor. I chose to think that fire had destroyed the factory, not the business. Again, the fire. I was on holiday in America when I got the phone call. I felt totally impotent. I got back two days later to a smouldering carcass and traumatised staff. I had 10 jobs to maintain, a number of mortgages to pay, 10 tables to put food on. When things are going well you don’t think about your responsibilities as an employer so much. It’s only when things go wrong that you think about the enormity of your commitments. I rarely see setbacks and when I do, I respond practically. If a situation arises I analyse it to see what I can do and, if I can’t do anything, I’ll move on. You have to learn not to worry about things you can’t change. Where I can do something, I’ll redouble my efforts to do so and, if I hit a cul de sac, I’ll just go by another route. I would expect to find a solution, it’s my nature. I don’t like it. I do my best to mitigate it. I only take on calculated risk. If there’s a wall, I’m not for running and jumping. I’m the ‘walk up and take a peep over’ guy. Why be stupid? I’m comfortable with debt and I don’t see it as a risk. There’s good debt and bad debt. Good debt is the mortgage on your home – you have to live somewhere. Bad debt is the high interest rate you’re paying on your credit card. The only risk in relation to debt is overextending yourself, and you’ve got to know where that line is. Richard Branson has the quintessential qualities of the early stage entrepreneur. He’s a disruptor, sees a gap in the market and goes for it and, after a couple of years, hands it over to a management team. He knows his strengths. I lived in a Bangkok for a while and there was an Irish priest who worked in the slums there day in, day out, that nobody will probably ever hear of. He inspires me. As for motivation? I don’t need anyone to motivate me. My business is also my hobby but down time is spent with my family, I am very fortunate that my wife, Nickie, provides the support at home that enables me to travel and work when I need to. I also walk and listen to audio books as I go, often business ones. I’m not sure. The mistakes are where I’ve done most of my learning. You have to cut your teeth. The steps I’ve taken have brought me to where I am now, so I don’t think I’d change any of them. Remaining relevant to our customers. I’m doing an MBA and it has opened up my mind to the fact that I’m not in the food business so much as the tourism business, and my competition isn’t other chocolate makers, it’s anything a person could spend €20 on, whether it be a voucher, a bottle of wine or flowers. Find out the customer’s real needs and provide a solution. Disney’s customer service training programme asks park staff how they should respond to the woman with two kids who comes up to you and asks what time the 2pm parade is at. The obvious answer is “2pm”. The right answer is, “Well, I think if you were to go to that corner at around 1.45 your children would have the best chance of seeing Mickey as he passes.” Delve deeper. Don’t be afraid to fail. It’s the step before success. US venture capital companies often ask about a promoter’s previous failure and, if they haven’t got one, they won’t entertain them. They want the learning that goes with failure, but they don’t want it on their dime, so fail early and fail fast. You can browse through Colm’s offerings on the website for Skelligs Chocolate.